We celebrated the rare feast of Thanksgivvikuh with my sister’s family in Austin. It was an exercise of collaboration and creativity that produced some delicious surprises and new favorites. And so it was with great enthusiasm that I pondered my sister’s request for some reinvented seder dishes for an article she was writing on the Passover feast. Among the dishes we discussed, I was drawn most to the charoset which, in my somewhat limited experience, has been wonderful or dreadful. The dreadful versions involved browning apples sitting in a liquid of sorts that more immediately reminds you of the actual mortar it represents than something truly edible. So I was compelled to try something more in the Sephardi style using figs. In a completely separate culinary brainstorm for Chinese New Year I was planning a pork belly with charred oranges and decided that a toasty, caramelized citrus would be a great pairing. Recently enamored with all things pickled, I chose to steep the figs in a vinegar solution while toasted walnuts and a vibrant parsley completed the dish. I think this updated version would be a great addition to the Passover meal alongside a crispy roasted chicken. Though it was also amazing with some incredible berkshire pork chops…unorthodox, but divine. Heat your broiler. Heat a medium-sized pot over medium low heat. Toast walnuts until just fragrant, stirring often. If you are easily distracted do not leave the pot! They will burn easily. Remove walnuts and let cool. Coarsely chop. Toast fennel and coriander until fragrant (same rule as above). Add vinegar, water, salt, and 1 tablespoon sugar and stir until dissolved. Add figs and simmer for a couple minutes, then let cool. Place clementines and lemon on a baking sheet and sprinkle remaining 2 teaspoons of sugar on top. Broil about 10 minutes until they start to char, rotating the pan halfway through. Keep an eye on these as well — they can go from pleasantly charred to miserably charred very quickly. When done, cut slices into quarters. Your figs might have soaked up all the liquid, but if not, remove with a slotted spoon to a bowl. Toss gently with citrus, walnuts and parsley. Arrange on a platter and drizzle with honey. 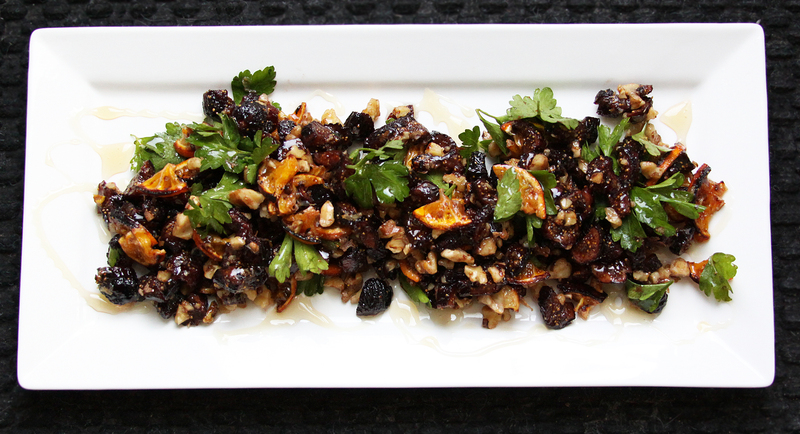 (To make ahead, you can toss figs and citrus together and fold toasted nuts and parsley in just before serving).